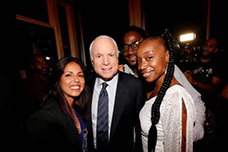 Senator John McCain joined the premiere party and screening for Pivot TV’s new series “Raising McCain” (featuring his daughter Megham McCain) and “ Jersey Strong” (premiering back-to-back on Saturday, September 14 at 10pm & 10:30pm ET, respectively). Senator John McCain (center left) is joined in this photo by cast members of “Jersey Strong,” reformed Blood and Crip gang members Jayda Jaques (far right) and Creep Evans (center right) and attorney Brooke Barnett (far left). “Jersey Strong” is a new docu-series that was filmed in Newark, centered on two strong, but very different women—Jayda Jaques and Brooke Barnett—who share a common goal: to do some good in the hood. Jayda is a reformed Blood gang member who has set out to right the wrongs she did as a foot soldier for her gang. She and her fiancé Creep, a reformed Crips gang member, are a real life “Romeo & Juliet in the hood,” raising two kids amidst the pressures of rival gangs, economic uncertainty, and ongoing violence of inner city Newark, New Jersey. Brooke is a tough-as-nails trial lawyer whose early run-in with the law as a teen inspired her to champion the cause of the criminally accused – including Jayda, who she once defended and successfully kept out of jail. Brooke runs her law firm with the help of her partner in love and law, Maggie Voelkel, with whom she’s also helped to raise two now college-aged kids. “Jersey Strong” premieres Saturday, September 14 th at 10:30pm/9:30pm CT on Pivot. “Raising McCain” is the new genre-bending docu-talk series that follows Meghan McCain, the outspoken daughter of Senator John McCain, on the road talking to unexpected experts, regular people and members of her generation, exploring the most important and unusual questions of the day framed by Meghan’s experiences in her personal life. “Raising McCain” premieres Saturday, September 14 th at 10:00pm ET/9:00 pm CT on Pivot.